Fiber optic Internet is the future of broadband. Fiber optic Internet is the future of broadband. It uses fiber-optic technology to reach the fastest speeds available today, as fast as 10000 Mbps (1Gpbs). Broadband is essential to the modern world we live in. Powered by fiber optic technology, fiber Internet is blowing its competitors out of the water. In this guide, we will cover everything you need to know about fiber Internet, including how it works and the challenges associated with it. When we refer to “fiber” in this guide we are talking about fiber optic Internet, which is a form of fiber-optic communications. By sending a beam of light through fiber optic glass cables, we are able to transfer information through what is a truly fascinating process. The Core:Usually made of glass, the core is the innermost part of the fiber, where the light passes through. The Cladding: Usually made of a thicker layer of plastic or glass, the cladding is wrapped around the core. These two parts work together to create a phenomenon called total internal reflection. Total internal reflection is how light is able to move down the fibers, without escaping. It is when the light hits the glass at an extremely shallow angle, less than 42 degrees, and reflects back again as if reflecting against a mirror. The cladding keeps the light in the core because the glass/plastic it is made of has a different optical density or lower refractive index. Both these terms refer to how the glass bends (refraction)and therefore slows down the light. Light is transmitted down the fiber in LED or Laser pulses that travel extremely fast. These pulses carry binary data, which is a coding system that makes up everything we see on the Internet, even the words you are reading right now. Binary code is made up of bits, which are just ones and zeroes. These bits send messages in organized eight-part patterns, called bytes. It is easy to translate the bits of binary into light pulses. One pulse means one and no pulse means zero. These pulses can travel sixty miles before they experience any degradation. To transport data across thousands of miles these pulses go through optical amplifiers that boost their signal so that no data is lost. Once the pulses reach their destination, an optical network terminal (ONT) converts the light pulses into electrical Ethernet. This is how light becomes something you can use to actually connect your devices to the Internet. This conversion happens at the end of the Last Mile, which isn’t actually a mile at all, but a term for the last stretch of fiber that connects the consumer to the backbone of the Internet. 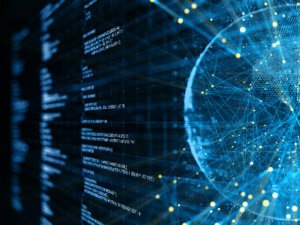 The backbone of the Internet is what makes it possible for people across the globe to connect via the web, and most of it is made of fiber optic cables. Fiber optic Internet may seem like brand new technology, but it has actually been around since the early days of the Internet. In 1988 fiber optic cables were laid under the ocean to connect the U.S. and Europe. They were the first submarine lines to be laid, and today they have expanded to crisscross the entirety of the ocean floor. The backbone is the core of the Internet. The instant you connect to a website, no matter the device or the destination, multiple steps are being taken to bring you there, and every one of them is connected by the backbone. There are several types of last mile fiber connections an Internet service provider (ISP) can install, each one varying in how pure your fiber optic Internet connection actually is. Each one is referred to as “Fiber to the X” or “FTTX”, with x representing where the optical fiber connection actually ends. FTTP/FTTH/FTTB/FTTD: Fiber to the premise, home, business or desktop are the most direct fiber lines. With them, you are getting pure fiber straight to your residence, with no copper cables involved. These are also the most expensive fiber connections for the ISPs. 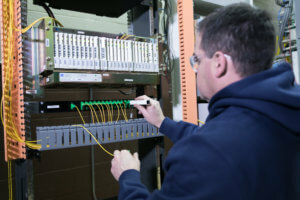 FTTB: With fiber to the building, the fiber line is distributed throughout the building by copper lines. This is a popular choice for apartment buildings, hotels, schools or buildings that provide Internet to several different businesses. Fibers biggest Internet competitors are DSL, Cable and Wireless Internet. DSL Internet is provided by copper phone lines that have been the norm for over a hundred years. Cable internet also uses copper, but unlike DSL it uses coaxial cables were originally used for cable TV services. Fixed Wireless Internet, like cell phone service, is provided through radio waves broadcasted from towers, and then sent over frequencies. As with anything, there are pros and cons to fiber Optics when compared to its competitors. Low Fiscal and Environmental Costs: DSL does the least amount of damage, both environmentally and economically. Copper cables can usually be found even in the most rural of areas because it was originally laid for telephone connections. The cables can be reutilized, so new building projects are not necessary. Fiber optic infrastructure or wireless towers can be expensive, and come at the added price of natural habitats, not to mention added Co2 emissions. On the other hand, fiber infrastructure doesn’t require electricity, which is very eco-friendly. Of all the competitors, cable produces the least data for the most electricity. Availability: Again, copper cables have already been laid in most areas for telephone use so, as long as they are in good condition, reusing them to create Internet service is fairly simple. At this time, fiber optic Internet isn’t available in many rural areas, but bringing faster and more reliable Internet to rural America is becoming a growing priority for both municipalities and providers. Interference: Copper wires can do serious damage if not properly installed and maintained. They can release electromagnetic currents that interfere with wires and severely damage a network. Fiber cables will neither emit electromagnetic waves nor be damaged by them. They are made from plastic and/or glass, therefore are unaffected by the harmful waves. 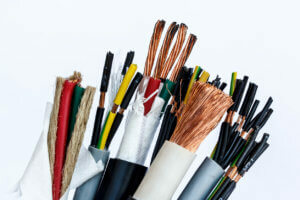 Copper cables also conduct electricity, so they pose a fire risk if not properly installed and maintained. This fact also means they are more susceptible to lightning and can be very dangerous if they go down during a storm. Attenuation: Attenuation, means the weakening or loss of a signal. Given distance signals sent over copper wires degrade much faster than fiber. After 320 ft. of cable, fiber loses only three percent of its signal, whereas DSL/Cable lose 94% at the same distance. Symmetrical Speeds: Everyone uses the Internet in one of two ways, downloading and/or uploading. When you watch something on Netflix, you are downloading. When you upload a video to YouTube, you are uploading. Downloading and uploading are usually represented as different speeds. Most casual users only have to worry about the downloading speed, but telecommuters, those dependent on telemedicine, and most businesses need higher uploading speeds as well. One of the many things that makes fiber optic Internet superior is that it provides symmetrical speeds, meaning its download and upload speeds match. DSL and other types of Internet, only offer asymmetrical speeds, where download speeds are faster than upload than upload speeds. Price: Cable Internet is one of the most affordable Internet options. Unfortunately, you get what you pay for, since their speeds aren’t as fast as wireless or fiber, and often include data caps. Sharing is Not Caring: Cable can reach download speeds of 100 Mbps (still only a tenth of fiber but more than DSL), but cable Internet is shared from a central node where the ISP meets the local coaxial network. This means anywhere between 100-2000 homes have to share a single node. Sharing like this often leads to low speeds during peak use hours. To manage this, companies have been throttling users Internet, meaning they slow down your bandwidth after you have used a certain amount. The idea behind this is to give everyone sharing the node an even amount of service, but can often be frustrating for consumers. Cable companies have also been known to put caps on how much data your household needs, and then charge you extra for additional data. It’s Wireless: As a testament to its name, fixed wireless truly is wire free. Once a tower goes up, radio waves transmit a carrier’s signal across frequencies. 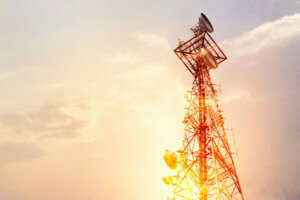 This wireless means fewer materials are needed, bringing down the overall cost of purchasing, building, and maintaining. It also means no fallen cables resulting in loss of service. Access: There are many areas so rural that providers can’t justify the expense to lay fiber, or build DSL to them. If you live up a mountain, have very few neighbors, or are so far off the beaten path your mail comes by carrier pigeon, Wireless maybe your only option. Usually, even the most rural areas will have some sort of tower near enough to gage a signal. Line of Sight: With fixed wireless, the biggest limitation is that the consumer’s antenna has to be within the line of sight of the provider’s wireless tower. If a line of sight can’t be established, like if you live in a hilly area, wireless won’t be an option for you. Congestion: Fixed wireless has the potential to meet fiber optic Internet speeds, but circumstances prevent the radio waves from ever catching up to the photons</strong>. You already know that Wireless degrades with distance, bringing the speed down with it, but there is a greater issue at hand. As with a cable connection, fixed wireless users share bandwidth across their local network, so when many people are accessing the network at once, the speed slows. To put this in perspective, let’s say you are paying for a 100 Mbps network, but your share that network with all ten homes in your neighborhood. If everyone is on at once, you are getting 10 Mbps at best. Whereas if you are paying for a 100 Mbps network of fiber, that speed is just for your home alone. In 2016 3,424,971,237 people worldwide accessed the Internet. In the U.S. alone, 88.5% of citizens used the Internet. Every year these numbers grow, and the Internet becomes more and more important to our everyday lives, on an individual, and societal level. Broadband makes it possible to stream movies and shows to your Smart TV. 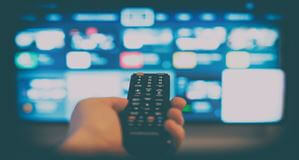 Entertainment and Connectivity: We have all become used to having the world at our fingertips. We may browse recipes, check the latest stock information, video chat, stream a movie, download music, or play interactive online games. With fiber optic Internet, ISPs are able to provide enough bandwidth to do all of those things at once, without having to sacrifice service quality. Smart Homes and Security: Smart Home technology is one of the Internet of Things (IOT) fastest growing markets. Connect every aspect of your home so it runs seamlessly from your smart device. You can also monitor and protect your home remotely using Smart Home Security. Telecommuting: Fast access to the Internet makes it possible for professionals to telecommute. Working remotely allows people to live wherever they want, without having to sacrifice career opportunities. Further, symmetrical fiber speeds make uploading content to/for work just as easy as it would be sitting in the office. Distance Learning: Educational and enrichment opportunities for every age group are quickly becoming the norm at colleges, adult education programs, and even as virtual elementary schools emerge. Symmetrical speeds, once again, are a key part of this process. They allow students to quickly upload their assignments from home. K-12 Education: Aside from the obvious access to information for studying, children and their parents can always be engaged in the educational process through educational web portals. These portals provide an interface to communicate with teachers and administrators, real-time access to assignments and grades, and numerous educational resources. Access to Health Care: Telemedicine has made advances that allow for the digital transfer of information that once required traditional telephone technology. Today, high-speed fiber connections allow health care professionals to evaluate, diagnose, and treat patients in remote locations using telecommunications technology. Fiber optic Internet provides seamless video connections, so patients in remote locations can access medical experts quickly and efficiently without having to travel. Independent Living for the Aging or Disabled: Aging in place and independent living are quickly becoming more important to us as the population ages. The most affordable home automation products are cloud-based and Internet-dependent. A wide array of products from voice-activated devices to panic alarms can have a profound impact on quality of life for senior citizens, the disabled, and the people who care for them. Broadband is an important tool for government, big and small. E-Government & Civic Participation: What makes government work as it should is transparency and public engagement. Access to reliable, high-speed Internet allows live streaming of municipal, state and federal proceedings – either in real time or more importantly on demand. Government websites and social media provide a continuous stream of information to the public as well as forums for public participation. Citizens can pay taxes online, register vehicles, procure hunting, fishing, and pet licenses, and with the click of a button, communicate via email with elected officials and staff. Many government entities have employed a messaging system that allows citizens to use any smart device to alert officials about everything from dangerous potholes to emergency situations they might witness. Energy and Environment: Transportation and power generation are 2 of the biggest impacts on global warming. Both Smart Grid technology for electricity generation and distribution and metering, and improved transportation management can develop efficiencies that will greatly reduce emissions and ultimately the carbon footprint. Hi-speed fiber internet connectivity is integral in both cases. Libraries: Particularly during economic downturns, libraries become a haven for the public, providing computers and internet access, books and movies for inexpensive entertainment, and assistance with online job searching. Regardless of the economic climate, libraries are automated to the point that users can download digital media from home, reserve and renew books online, and access a myriad of web-based enrichment and educational tools. Economic Growth & Quality Jobs: Data indicates that hi-speed or broadband internet will improve the economic climate. Not surprisingly, according to some studies, the greatest positive economic impact is likely to be realized in rural underserved communities. This assertion is quite logical when one considers population density, income and education demographics, and the current economy in rural America. Rural America, simply put, has the most room for economic growth. The importance of broadband can no longer be denied, yet almost fifty percent of people living in rural America do not have adequate Internet service. To put that in perspective, 95% of the country is considered “rural America”. Across the country, municipalities are working on building reliable broadband in their area so their communities can be competitive in the modern economy. 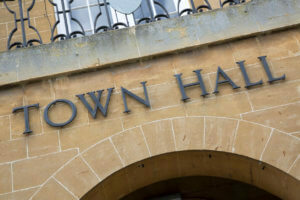 Whether they are looking to the FCC for help or turning to their local ISPs for partnerships, municipalities are still taking on an extremely costly and complicated project. With thousands, if not millions of dollars being invested, municipalities need to consider the longevity of the Internet medium they choose. It is clear to everyone that fiber optic Internet is the future of broadband, but building fiber infrastructure isn’t a simple process. There is a reason that only 25% of the country has available fiber. It isn’t because ISPs and municipalities are not interested, but because there are immense hurdles involved in these projects. Aerial building: Fiber to the pole is complicated. It is a six to eight-month process, and with so many variables, there is no way to know the real long-term cost. An ISP with existing copper infrastructure on poles is going to have the easiest time putting up new aerial fiber, but they are still looking at the costly price of personnel, installation, and upkeep. Leasing existing poles really has an immeasurable cost, because, in theory, you will be paying for the lease for years and years to come. Not to mention, you are still looking at the cost of personnel, installation, and upkeep. Building new poles is not just an issue of cost, which is very high, but geography and local policy. You may have all the funds in the world to build fiber poles, but you can’t build a pole in the middle of a lake or on the edge of a cliff. Once you find that perfect spot, local regulation is going to determine whether or not you can actually build it there. Even municipalities working to install community networks have to consider existing utility infrastructure when putting up new poles. The upside of installing or owning poles is that they can be leased out in the future. Buried in a new or existing conduit. Plowed in using special machinery. Put in using directional boring. Buried directly in a trench/micro-trench. Blown into already buried ducts. 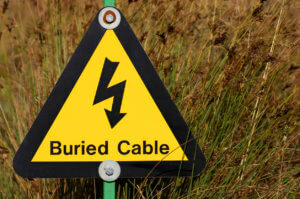 Buried cables can be dangerous if not properly labeled. No matter which technique is chosen there are going to be some recurring challenges and concerns. The most important aspect of burying fiber cable is that the ISP/municipality plans where they are digging since so many different things end up buried underground. Not checking can be life-threatening if someone ends up accidentally digging up anything with high voltage. Dig Safe is a nonprofit clearinghouse that works with utility service to ensure the safety of a dig site. Before anyone digs, they should go to the Dig Safe website to understand the proper procedure. Once you have marked out where you want to dig, you can call Dig Safe’s toll-free number (811) to make sure your desired dig area is safe. Equipment cost is another consideration. Special machinery has to be used to pull up existing conduit, and plow, trench or bore fiber into the ground. Submarine trenching can be an especially costly, but necessary, project to undertake. The last thing to consider is how much of a commotion digging is actually going to cause. A municipality planning on providing new infrastructure to a whole town is more than likely going to have to go right through the center of town. That means pulling up existing infrastructure, like roads and sidewalks, then inevitably having to repair them. Not only is this expensive, but it also leads to road closures that ultimately annoy everyone in the community. This issue led to the Dig once practice. When A Municipality works on utility projects, like a water main, they use that opportunity to place broadband structure as well. This way they save money and avoid inconveniencing their community multiple times. No matter how you cut it, bury it, or string it up fiber projects involve a lot of manpower. These are not jobs just anyone can do. Parts of the process can be contracted, such as the trenching, but the majority involves full-time experience employees. Licensed professionals will have to be hired to run the heavy machinery. Planning infrastructure requires experienced engineers to map out where and how networks will be built. Wiring and maintaining the network means hiring both engineers and electricians full time to be in the central office, on a pole, or in someone’s home. Not to mention, if the personnel doesn’t already have experience working with fiber the company and/or municipality has to spend time and money training them. Engineers have to take care of poles even in dangerous situations. When a company doesn’t have enough of the right people for the job they have to budget out hiring a new person vs. contracting that position out. It can sometimes end up being more trouble than it is worth, resulting in that project being put aside for another. One of the reasons it is often easier for municipalities to work in partnership with ISPs to build fiber infrastructure is because of the experienced and expensive personnel needed. This is a challenge for any business venture that involves large expensive projects. Building fiber involves a very large upfront cost. If you are an ISP, in theory, that cost will be paid back over time by the customer’s monthly fee. Unfortunately, it takes years for the company to see a return on investment. Let’s look at an example of an ISP building out to a rural area. Say it costs roughly $20,000 per mile for the ISP to build, plus an additional $600 for each home they build to. For this example, we will say that there are 13 homes per mile, so if you do the math (20,000/(13*0.5) + 600) this company is looking at around $3,677 per home. Unfortunately, not every home is going to subscribe to fiber. We can estimate a take rate of 50% for this example, with each customer paying $65/month. The general monthly cost of the provider has to be subtracted from the monthly cost before you can tell what the actual profit will be, and usually, that is above half of the monthly cost. It is most likely that the monthly profit for the provider here would be $30. 55. When you divide that monthly profit by the $3,677 it cost to build to each home, this company is going to have to wait ten years before they see a return on their investment. New businesses opening in the town. A younger population moving in. More families setting down roots in the community. Broadband infrastructure is a hot-button issue in government right now. From Washington to your local state house politicians are trying to decide the best way to connect us all. Whatever changes the government makes, now or in the future, have to be carefully considered by anyone building fiber infrastructure. One way government is helping build better broadband is by providing grant money to ISPs and municipalities. The FCC Connect America Fund works to provide ISPs money, using the ACAM model, to build broadband infrastructure in rural areas. This is great for ISPs because it balances out the high cost of building fiber in rural areas. When an ISP builds new infrastructure in one specific rural area, they can delegate other funds to connect homes they pass along the way. This way an ISP can connect more homes. 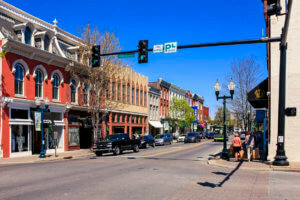 The FCC is also providing funds for state government grants that can be granted to rural municipalities looking to build out their broadband infrastructure. Municipal Broadband is a hot-button issue across the country. For municipalities to qualify for these grants that have to fit certain criteria. Criteria vary from state to state, as does the definition of broadband. When we talk about “defining broadband” we don’t mean a dictionary definition. What we are referring to is a minimum internet speed, defined by FCC and/or state government. This definition is a moving target right now, in January 2018 the FCC decided to keep their 2016 definition of broadband, leaving it at 25/3 Mbps. That does not mean every state’s broadband definition is 25/3 Mbps, in fact, some states have multiple definitions with the option to change them when needed. To qualify for any government funding though, a community has to have speeds that fall under a broadband definition. An ISP receiving any government funding has to build to the definition, though some grants have a specific build to definition. The build to definition means there are specific speeds an ISP’s new infrastructure has to meet. If those speeds are asymmetrical, such as 10/10, that ISP will have to build fiber. Another element of governments increased interest in broadband infrastructure is policy related. There are currently twenty states with laws that prohibit municipalities from building their own broadband network. Many of these state laws were lobbied into action by large telecom corporations. Under these laws, rural towns that don’t appeal to ISPs have no options when it comes to broadband infrastructure. 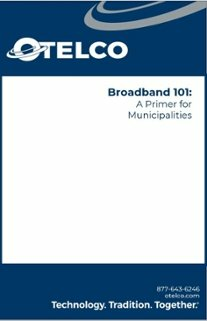 The majority of states do allow municipalities to build and maintain their own broadband though, including 24 states with that have at least one community with their own fiber optic Internet network. It is possible that, in the future, these state laws will no longer be applicable. Congress has been working on a bill that would overturn these state laws, paving the way for municipalities to build their own fiber infrastructure. “Future Proofing” is an important part of fiber internet infrastructure. When it comes to building fiber, whether it is an ISP or a municipality, building for the future is an important consideration. 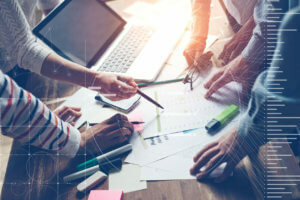 It is clear that the Internet of Things is growing and expanding, with new ways to connect our lives every day. The more things we connect the Internet the faster speeds we need to power them. That is why so many ISPs and municipalities are choosing to build future-proof fiber infrastructure now, versus outdated copper that will only need to be replaced in 10-20 years. More than that though, they have to build for changes in population and economic landscape. Building for the future often means building more fiber all at once, versus coming back in late to install more. Yes, building fiber optic Internet is expensive, but those large expenses have more to do with the infrastructure than the fiber itself. The cost of doubling strands of fiber can be a difference of mere cents, whereas the cost of changing infrastructure in the future can be between thousands, if not millions, of dollars. Dark fiber, optical fibers that are part of a fiber cable but are not currently being used, can be a great asset to an ISP or municipality. Dark fiber can be sold or leased out in the future, helping to speed up the investment return for ISPs or provide extra money to a municipality. Despite the concerns involved, many ISPs have dedicated themselves to fiber optic Internet deployment. Some ISPs have even committed to only building fiber infrastructure going forward, and are actively working to replace existing copper. OTELCO is one of many ISPs that has decided to embrace the future by using fiber for all new infrastructure projects, while actively working to replace copper wires with optical fibers. Now that you know more about fiber optic Internet you may be more interested in how one company is deploying it. 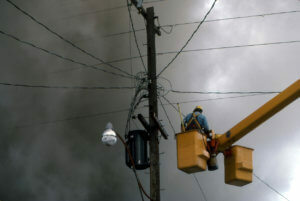 Aerial fiber: Fiber strung above ground, usually up on utility poles. Asymmetrical Connections: Internet connections with different download and upload speeds. Attenuation: The weakening or loss of a signal. The Backbone of the Internet: A series of networks that connect the Internet across the world. Binary: A code of ones and zeros that builds everything you see on the Internet. Bits: The individual ones and zeros that make up binary code. Represented as a lower case “b”, used to measure Internet speeds. As in Kbps, Mbps, and Gbps. Bytes: Patterns of eight bits that create binary messages. Represented as an upper case “B”, used to measure digital storage capacity. The Cladding: The cladding is the second layer of an optical fiber that wraps around the core. It is usually made of a thicker layer of plastic or glass, to create total internal refraction. Conduit: A tube or trough made of metal, plastic, fiber, or fired clay, that works as a protection for electrical wiring. The Core: The core of an optical fiber where the light moves through. The core is made of glass that has a very low refraction index, allowing the phenomena of total internal refraction to take place. Dark Fiber: Optical fiber in a fiber internet cable that is not being “lit” or used by an ISP. Often an ISP builds in the dark fiber so they can light it up when needed, or lease it out to other ISPs or interested parties at wholesale cost. Fiber Optic Technology: Technology that transmits data using light and optical fibers (glass or plastic threads). Fiber Optic Communications: The transportation of information through optical fibers, using glass and pulses of light. FTTP: Fiber to the premise, a last mile fiber connection that provides a pure fiber connection directly to the premise. FTTH: Fiber to the home, a last mile fiber connection that provides a pure fiber connection directly to the home. FTTD: Fiber to the desktop, the Last Mile fiber connection that provides a pure fiber connection directly to the user. 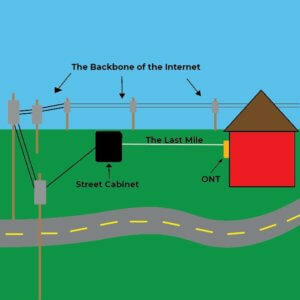 FTTN: Fiber to the neighborhood, a last mile fiber connection that provides a fiber connection to a neighborhood cabinet, that is then distributed to the neighborhood through either a fiber splitter or through copper wiring. FTTB: Fiber to the building, or fiber to the basement, a last mile fiber connection that brings fiber as far as the building, and then distributes it throughout the building with copper wiring. FTTB can also refer to fiber to the business, a last mile fiber connection that provides a pure fiber connection directly to a business. FTTC: Fiber to the cabinet, or fiber to the curb, is a last mile fiber connection as far as a local cabinet that is then distributed to residences, and businesses through either a fiber splitter or (more commonly) copper wiring. FTTS: Fiber to the street, is a last mile fiber connection as far as a local cabinet that is then distributed to customers through either a fiber splitter or (more commonly) copper wiring. Gbps: Gigabits a second, or a billion bits per second. Internet of Things: The IoT is actually a complicated, and constantly changing thing. Simply put, it is the concept of the interconnectivity of many different devices (phones, cars, appliances etc.) that are all embedded with technology that connects them to the Internet. Kbps: Killa bits per second, or a thousand bits per second. Last Mile: The last stretch of fiber that connects the consumer to the backbone of the Internet. Mbps: Megabits per second, or a million bits per second. Optical Amplifiers: A device that amplifies optical signals without having to convert them into electricity. Also known as optical repeaters. Optical Density: The degree to which a refractive medium retards transmitted rays of light. Optical Fibers: A flexible transparent fiber made by drawing glass or plastic to a diameter slightly thicker than that of a human hair. Refraction: Refraction is the bending of light (it also happens with sound, water, and other waves) as it passes from one transparent substance into another. Refractive Index: An equation that describes how light travels through an object. Symmetrical Connections: Broadband connections that have different download and upload speeds, for example, 25/10 Mbps. Telecommute: Working from home with the use of technology. Telemedicine: Remote patient care via telecommunications technology. Total Internal Reflection: when the light hits the glass at an extremely shallow angle, less than 42 degrees, and reflects back again as if reflecting against a mirror.